Subaru, who is 16.5 percent owned by Toyota Motors has a very unique opportunity that many automakers would love to have. Where else could you get inside information on how to build the competitions best-selling mid-size sedan? They get hands on exposure to Toyota’s production methods and gain valuable experience in producing their own vehicles, especially the Legacy sedan. It’s got to be the best of both worlds for Subaru. While they would like to have the production volume back from the Camry line in Indiana because of their increase in sales, what they gain is not worth losing. But the company is finding it increasingly difficult to keep pace with growing demand. Its volumes are still too low to justify a new plant, while its existing facilities are bursting at the seams. At its U.S. manufacturing plant in Indiana, Subaru produces 170,000 Subaru vehicles a year along with 100,000 Camry mid-sized cars for its biggest shareholder Toyota. That gives Subaru plenty of experience and knowledge into Toyota’s production methods. In a recent Reuters report, Fuji Heavy Industries (FHI) chief executive Yasuyuki Yoshinaga said in a results briefing, "Regarding Camry production, there have been some news reports but we ourselves have absolutely no desire to halt that.” (Camry production). We get first-hand exposure to Toyota's production methods, which is a good learning experience for us." FHI’s chief stressed the importance of the Toyota alliance for a small automaker like Fuji Heavy. Toyota is the largest automaker in the world with production of more than 9 million cars. Subaru gains valuable information from Toyota into its mass-market success of mechanical and stylistic homogeneity. 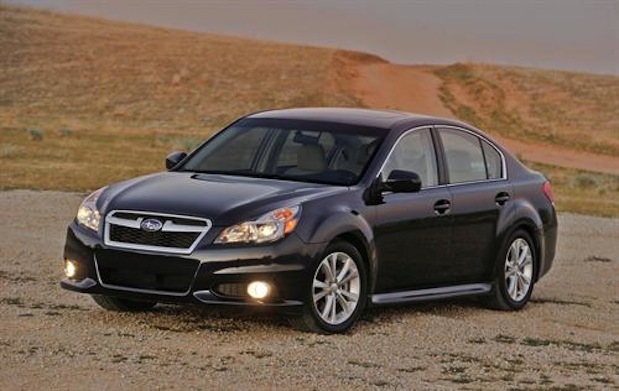 Even though Subaru is a niche-oriented automaker, it will help them with a vehicle like the Legacy sedan. Fuji Heavy is reported by Nikkei business paper to be doubling its U.S. output by 2016 by partly discontinuing Camry production. But Yasuyuki Yoshinaga said last week they have a contract with Toyota and any such move would be up to them. With a partial ownership in Subaru, it may be worthwhile for Toyota to give up their Camry production so the smaller company can grow their largest market in the U.S.
Watch for Subaru to increase production and continue to grow here in the U.S. and around the globe. They will definitely take what they’ve learned from Toyota to learn new and faster production methods. Toyota is up against a wall production-wise as well. They've about hit the limit for their North American production capabilities and don't have anything in the immediate pipeline to grow it, so they'll have to keep the Subaru contract for the Camry or risk losing market share due to production limits. Subaru of America does not build the Camry not due they have any business relationship with that activity. Subaru of Indiana Automotive, Inc. build the Camry and is a separate company from Subaru of America.